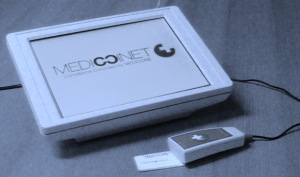 The DataTaker™ is a 10” touch screen computer specially designed to enable the quick and easy programming and reading of a smart medication packages in a professional setting. Connect the DataTaker™ to the Internet, plug in the NFC hand scanner, switch it on and the Datataker™ starts up automatically and displays a login screen. Authorised users can type in their name and password, or scan a login card to log on to the system. After login, the DataTaker™ is ready to read (hand-in) or program (hand-out) smart medication packages. When a smart medication package is handed-out to a subject, details including the hand-out date and time, the subject ID and the product ID are programmed into the smart medication package. When the (empty) smart medication package is returned to the distributer, he or she performs a hand-in. The package is scanned and the data is transferred to the DataTaker™. The data stored in the package is displayed as a list or as a chart. The data gathered in this way is also sent via the Internet to the dedicated database for storage or further analysis. DataTaker™ software updates are automatically downloaded and installed.